Shots ring out on a quiet night in the hoity-toity area of Bannerman Park, St John's, Newfoundland. Running to the scene Inspector Stride finds respected businessman Harrison Rose dead, two bullets in the chest and one in the head. No one witnessed the incident though all near the scene of the crime heard two shots not three. Although Rose was a neighbour of Stride's, he knows nothing about the man. This was a guy who kept to himself but something in his past made him the target of a killer. Who would want a decorated hero of the Great War dead? I wasn't in love with Death of a Lesser Man by Thomas Rendell Curran right away. In fact, I started to wonder if this was a book for me. It started very slowly with Stride asking question after question. Sometimes I thought I was reading the same questions being asked over and over. I wasn't getting a feel for Stride's personality at all and was finding him rather dull. The style of writing wasn't quite what I was used to in a mystery story but at about the halfway point I was hooked. Curran is one sneaky dude. Harrison Rose is an enigma. No one knows anything about him. Stride has to start from nothing and slowly build a picture of this man. That picture keeps changing with each piece of information Stride finds. Rose is a man of many faces, not just a British businessman living quietly in Newfoundland. Without even realizing it, I was one of Stride's people in the investigation, along with Corrigan, Phalen and Noseworthy. I was trying to puzzle this guy out too. I wondered just what Rose had been into to get himself killed. Even Stride started growing on me. Well played, Mr Curran, well played. Though I was put off by the style at the beginning, I began to see just how clever it was. There are no fancy tricks. It's not remotely cozy and no one is racing through Europe looking for clues in paintings either. This is a bare bones mystery. The dialogue is what drives the plot forward. Not only does it provide answers to our questions but it shows the camaraderie and trust between Stride and his men at the Constabulary. They're respectful but good humoured. I loved the dry one liners that came out of them. The setting, both place and time, added depth to the story. First, foggy St John's is a good place to set a noir-ish murder mystery. If you're going to spend time standing around smoking in the rain, Newfoundland is a good place to do it. Then there's the time period, just after World War II, yet the first World War is what weighs heavily on the minds of the men in Stride's circle. Those scars run deep. This is also Pre-Confederation and Newfoundland is a small colony in Britain's dying empire. Stride doesn't find the British officials particularly helpful. They aren't quick to offer information and with a killer on the loose Stride needs all he can get. Like I said, the pacing is quite slow and a 300 page book felt more like 400. It took me much longer than usual to read a book of this length but in the end I was satisfied at how it all turned out. This is the third Inspector Stride Mystery but you don't need to read the first two. I am interested in reading them, though not right away. 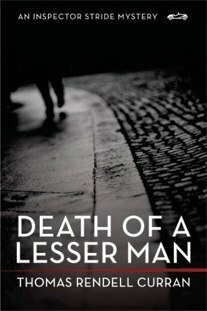 If you like your mysteries on the noir side and appreciate a slowly told story, I think you'll enjoy Death of a Lesser Man. Thank you to Taryn at Smash Publicity for the review copy. Great review. This wouldn't be my cup of tea. I abhor reading books with a slow pace. It feels too much like homework. But I am glad you gave a refreshing and honest review. I think I'd have to be in the right mood to read this one. It sounds like this is mystery that is more true to life than most mysteries we read. I imagine you do have to end up asking the same questions over and over and keep revising your theories. I love when a book 'sneaks" up on you like that. Silsbee- Hope you like it! Kathy- It's a moody book. Jenners- That's exactly it. More realistic. Nina- I've been picking up more mysteries lately too.